Playing games in a group can often be more fun than playing solitary. The interaction between group members can add an extra level of enjoyment to any game and even when the game requires a lot of concentration, there's still plenty of fun to be had. Most games require some level of concentration, but there are particular games that really need each player to focus on the gameplay to even get close to winning. 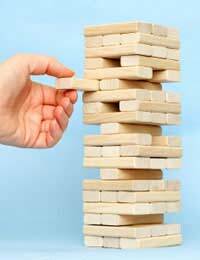 Jenga – a game where you must focus on what pieces other players are removing from a block tower in order to make an educated decision on which block to remove next. The aim is to stop the tower from tumbling. Operation – Another great board game where you can play in a group. You must concentrate intensely as you remove an item from inside the 'body' on the board. Can be tricky, but lots of fun. There are a number of great concentration games that you can arrange to play in groups to help break the ice. Many require people to be willing participants and have no place for shyness. These can be used in a party environment when you're mingling people together for the first time. Name Game – Each person must tell another individual something about themselves, normally their name, age and occupation. Everyone then gets together to try to remember what they've learned about everyone else. Concentration is key to impressing in this game, listen to everyone and try to recall what they've told you. Twenty Questions – Listening to other people give clues as to the person they're pretending to be requires lots of concentration and is a great game to play with a group or even in the car on a long journey. Many group concentration games require extended gameplay sessions over weeks or even months. Games such as role-playing titles, poker, war games or more require players to engage with each other over a long period of time. With such lengthy game play it's essential that you maintain focus and concentration throughout not only the session, but the length of play overall. Poker – poker in perhaps one of the foremost group games that requires high levels of concentration. Being able to read other players, watch their cards and know what is going on in the game is paramount to you winning. Role-playing – RPG's are extremely brain taxing with regards to concentration. You must try to focus on what is happening with the situation you're in and other players around you. Also, remembering what has occurred before can be paramount to your continued game experience.